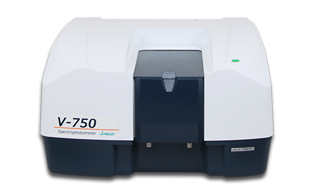 With a comprehensive range of sampling accessories, the V-750 is well suited to the measurement of samples in the UV and visible regions, with temperature control for biological samples and a number of transmittance and reflectance accessories for materials analysis. Two user interfaces are available. The Spectra Manager™ II software, the latest version of JASCO's innovative cross-platform spectroscopy software, is now compatible with Windows™ 7 Pro (32- and 64-bit configurations) and the Windows™ 8.1 operating systems.